The number one rule of dog training is to crate train. Dogs are den animals; if you use the crate correctly, your puppy will come to see the crate as their den, its safe spot. It’ll go there when it is afraid or uncomfortable, or needs to take a break from a chaotic or busy house. Frequently, dogs even choose to sleep in their crate instead of elsewhere in the home because they feel safe and cozy. Crates and kennels keep pets safe when no one is supervising them or when something unexpected happens. Dogs with separation anxiety, who might ordinarily destroy furniture or other property, will feel secure and—more importantly—be unable to hurt themselves or cause damage when crated. Also, crates keep pets safe during thunderstorms or on holidays like Independence Day or New Year’s Eve when noisy fireworks often result in lost and missing pets. When learning how to crate train a puppy, there a few things to remember. Start by choosing the right crate. There are a few types, and it’s important to get the best one for your lifestyle. An airline kennel—or travel crate—has solid sides with a wire mesh door, making it a good choice if you plan to travel with your pet. Crating during travel is the safest way to go, and solid side crates will protect your pet in the event of an accident. Wire crates are open on all sides and are a good choice if you only need a crate for your home. They usually have a slide-out bottom tray for easy cleaning and because the sides are open, allow the pet a full view of the room. Size is important! Your dog’s crate should only be big enough for them to stand up, turn around, and lie down comfortably. For a puppy that will grow into a large dog, you can avoid buying two crates by finding one that has a divider; this will allow you to enlarge the space as your dog grows. Now that you’ve chosen the perfect size and style crate, let’s talk about how you actually use it. First, don’t just put your dog in the crate, close the door, and walk off. That will make your pup averse to the crate, which would mean starting out on the wrong foot. If your dog doesn’t want to go in the crate right away, put a favorite treat just inside the door so that he’ll have to stick his head in the crate to get it. Be happy and encouraging. Since we are rewarding for going in, don’t give any treats for coming out and don’t force your pup in or out. In the early stages, most dogs will back out, but don’t worry about this. Toss a treat in and lots of verbal praise ‘Good Boy!’ when he enters the crate for it. After a while, your pup will begin to enjoy this game and build up confidence. Once your dog starts to get comfortable being in his crate, you can try closing the door. If he seems comfortable, leave him confined briefly—five to ten minutes, several times a day. Slowly add more time as his comfort level increases. If you are using the crate as a house-training tool, take your puppy straight outside as soon as you open the crate door so she understands that she should relieve herself outside instead of in your home. 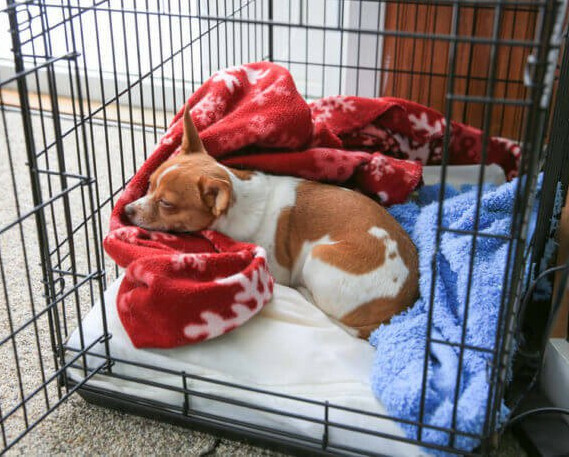 If your dog seems nervous in the crate, sometimes covering it with a blanket or towel helps the pup calm down—just be sure your pet can’t pull the fabric into the crate and chew it. Especially when training a puppy, it’s important to keep beds and towels out of the crate. Bored puppies chew, and blankets and beds can easily be ingested, resulting in major medical issues or even surgery. Teaching your dog to love her crate is a great first step in training her to be well-behaved and well-mannered member of the family. You can build on this new relationship with these smart ways to keep your pet happy while you’re away.